Home » Blood Pressure , Heart Health , Sexual Health » Why Making Love is good for your Heart and Blood Pressure ! Why Making Love is good for your Heart and Blood Pressure ! You might have heard this fact that making love is actually good for your blood pressure. But most of us don't known how does it help in keeping our blood pressure in control and whats the science behind that. Getting intimate with your partner is actually the best medicine for blood pressure. It not only cures it, but sometimes it can also act as a therapy for those who are already suffering from hypertension. The facts collected by betterhealthfacts.com are well researched from internet with an intention to increase the your knowledge about the good effect of love for your heart health. Keeping your blood pressure in control increases your life expectancy and reduces the chances of heart attack to a great extent. Aerobic exercises are beneficial for your heart health. Aerobic exercises are those workouts in which we use our big muscles in a rhythmic and continuous way. During love making we use most of our big muscles in the rhythmic and continuous way, thus it can be considered as a good aerobic workout. Regularly getting intimate keeps our weight under control and reduces the chances of being obese and further suffering from some heart disease. Obesity is itself considered a disease in US. Love Making keeps our testosterone and estrogen hormones in balance. It save us from heart diseases in long run. Indulging in a love activity releases oxytocin hormone in women, which has a direct effect in lowering the blood pressure. 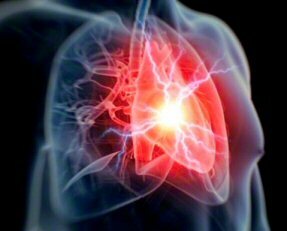 Just like smoking and high cholesterol diet there are some other factor like stress, anger, anxiety, and loneliness which are considered as a risk factor for heart attack. While getting intimate our body releases Endorphins which gives us a feeling of euphoria or well being and saves us from stress, anger, anxiety and loneliness. Thus our chances of heart attack are also reduced. Is it dangerous to make love if you are suffering with hypertension ? No, there is no danger in that. However making love increases your blood pressure for a few minutes but so does a number of other tasks. Even if you have ever heard of anybody suffering a heart attack while making love, then its just a coincidence. But if you are suffering with hypertension and still using some enhancement pills like Viagra then it may be dangerous. If your doctor have suggested you abstain from such activity due to hypertension (however it happens rarely), then its better to listen to him. Previously we used to say that love resides in our heart. But today we can say that if we keep loving somebody (with physical relation as well) then it keeps our heart young, and its scientifically proven now.